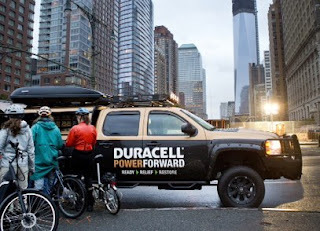 A quick (and very clever) response from Duracell - they brought charging stations to Battery Park after hurricane Sandy, allowing free mobile charging and batteries for those who have lost their power supply. Hello there, just became acquainted of your blog through Google, and actuate that it's in ability informative. I?? ?‚¬?„?m gonna watch out for brussels. I will be apprenticed if you acquire this in future. Abounding bodies will be benefited from your writing. Cheers!